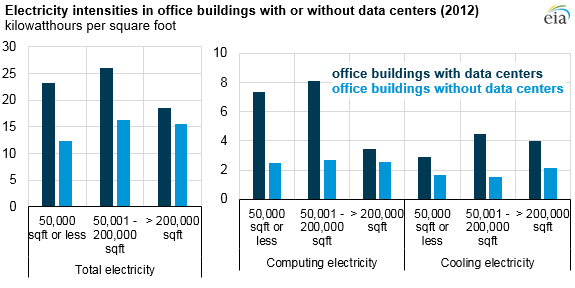 Data from the most recent Commercial Buildings Energy Consumption Survey (CBECS) show that office buildings with data centers have significantly higher computing, cooling, and total electricity intensity (consumption per square foot) than office buildings without data centers. A data center is a group of networked computer servers that performs functions such as data storage and processing and that is housed in one location, usually a secure area. These servers usually operate continuously, day and night. Data centers operate around the clock, are typically kept very cool to avoid failures associated with overheating, and may require a dedicated uninterruptible power supply. Large amounts of electricity are needed to power servers and cooling equipment. Useful metrics to put the electricity use of buildings with data centers into context include their total electricity intensities (total use of electricity per square foot), their computing electricity intensities, and their cooling electricity intensities. A comparison of computing, cooling, and total electricity intensities in office buildings of three different sizes shows that intensities are higher in buildings with data centers. Computing electricity intensity (which includes electricity used by servers and data centers, in addition to desktop computers, laptops, and monitors) is 35% higher for buildings greater than 200,000 square feet, and three times higher for all other buildings. Cooling electricity intensity in buildings with data centers is almost double that of other buildings in the smallest and largest categories of office buildings and triple that of buildings in the 50,001–200,000 square foot category. Total electricity intensity in buildings with data centers is 87%, 60%, and 20% higher than in buildings without data centers in the 50,000 square feet or less, 50,001–200,000 square feet, and greater than 200,000 square feet categories, respectively. In all comparisons, electricity intensity is higher for buildings with data centers, although the differences are smaller in larger buildings. In addition, some buildings use nonelectric fuels for space cooling where data centers are also likely to raise energy use. In some cases, data centers occupy the entire building. But in most cases, data centers are separate spaces within buildings. The 2012 CBECS estimates that 97,000 commercial buildings, about 2% of the commercial building population, have data centers. More than half of these buildings are office buildings. 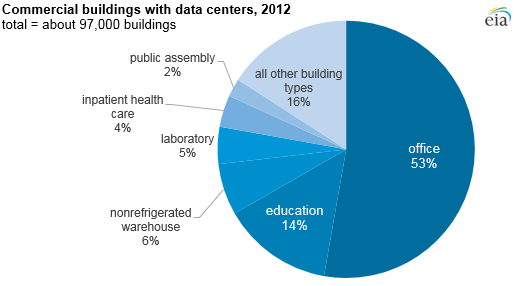 Data centers are also located in approximately 13,000 education buildings, 6,000 nonrefrigerated warehouses, 4,500 laboratories, and 4,000 inpatient health care buildings. The average data center footprint is slightly more than 2,000 square feet, an average of 2% of the total building size in buildings that have them. In aggregate, data center floorspace within U.S. commercial buildings totals about 194 million square feet, about half of which is in office buildings.